The most fun you'll have playing Excitebike without actually playing Excitebike. 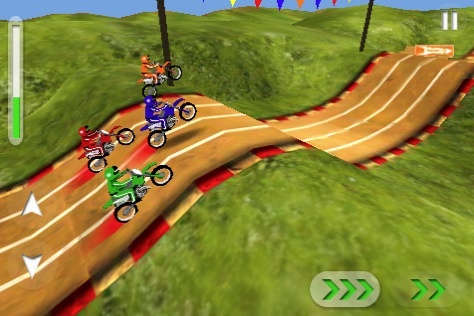 Unless some miracle occurs, we'll never see Excitebike on the iPhone and iPad. That said, Rocket 5 Studios has a great alternative with Giant Moto, a game that copies Nintendo's classic formula and costs less than a buck. Minor quibbles aside, Giant Moto is a winner when it comes to gameplay. It utilizes both motion controls and virtual handling quite effectively. You'll tilt your iPhone to perform wheelies and land jumps (so you don't end up in a roll-over), while pressing buttons on-screen to hit the gas and use occasional turbo. Like Excitebike, if you accelerate too much with the turbo, the engine overheats. Fortunately, you can switch between gas and turbo rather easily, and small arrows scattered on the tracks cool things down. Giant Moto looks similar to last year's WiiWare release, Excitebike: World Rally, with 3-D riders and tracks viewed from a constantly moving side angle. Still, Rocket 5 Studios did a good job replicating the formula for play on Apple's platforms. The 3-D visuals are quite nice and the game moves along speedily, even with four riders on-screen at once. The crowd is placeholder fuzz, but we don't buy these games just to look at the audience. As for the music, it's decent stuff, with plenty of rock tunes in the background and authentic motorcycle engines. 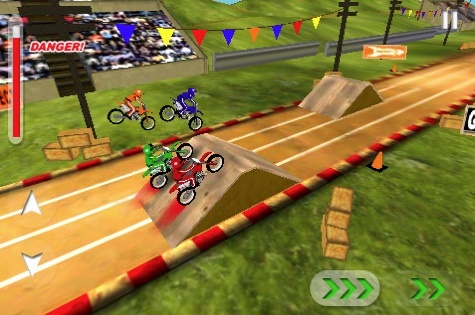 Although it lacks multiplayer and originality (hopefully Nintendo won't sue), Giant Moto is the closest thing we'll get to Excitebike on the iPhone. Its presentation is solid and the gameplay makes it fun to return to, especially if someone gets a better time than you. Enjoy. What's Hot: Only a dollar, terrific combination of virtual and motion controls, 3-D riders and tracks look great, OpenFeint support. What's Not: Flat looking crowd, no Career or versus multiplayer modes.